020 06/23/06 Tropic Escalante Camel crossing! What an unbelievable day! 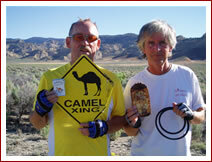 Lying beside the road we found a "camel Xing" sign (see photo). We believe this marks the historic trail used by the Bedo-indians to move their camel herds to higher ground for summer grazing. It is a little known fact that the Bedo-indians migrated to the southwest United States with their camels eons ago from the Arabian peninsula. To substantiate our claim please note in the photo a pack of camel cigarettes (much-loved brand of the Bedos); an agal (better known as a fan belt), used by the Bedos to hold their ghuttra headscarfs; and a rusty can of Chunky Camel Soup (well-known to be a favorite of the Bedos). 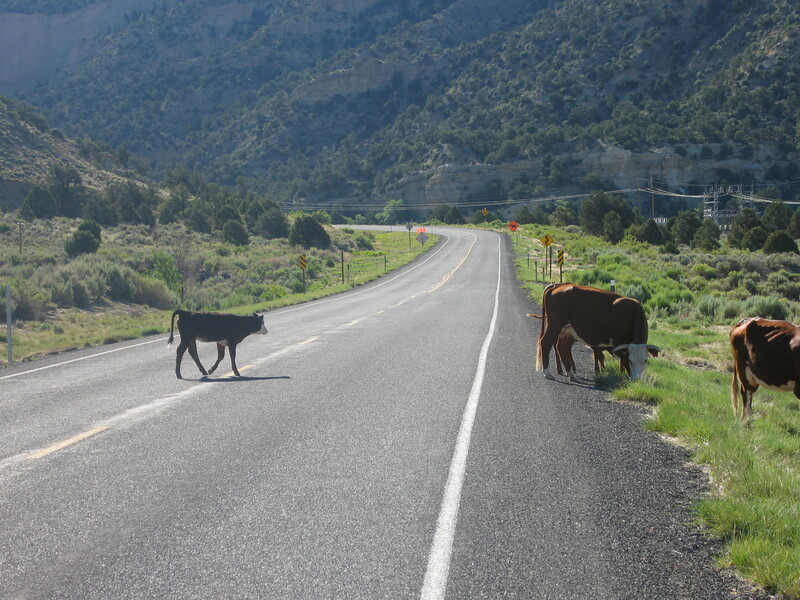 Coincidentally, we observed wild cattle crossing the road at this very spot. 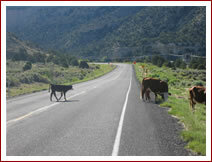 We believe these cattle evolved from ancient camels and are instinctively following this same trail. We invite additional comments on this theory to be posted on the forum page by the eminent Middle East scholars, Budman (in Miami Beach), Stew (in Ocala), Mike (in Louisville), and Bob (in Ashby). We look forward to their scholarly insights. Before this historic find we met 11 cyclists who were participating in The Big Fix, a cross-country bicycle ride, using single-speed, fixed-gear bicycles, averaging 120 miles per day. The ride is from Davis, California to Boston, MA. and is being done to raise funds to "fix" a rare condition afflicting children and young adults. Please see their website www.fixhistio.org for more info. As far as our cycling day is concerned, we continued to see astounding sights as we cycled up and down the canyons of southern Utah.